Under the impact of climate change, the variation in the magnitude and frequency of extreme precipitation events has become a major issue worldwide. Based on the daily precipitation data at 9 meteorological stations and 111 precipitation stations in the Hekouzhen-Longmen region (HLR) in the middle reaches of the Yellow River Basin during 1966–2015, the spatial and temporal variations in and statistical probability characteristics of extreme precipitation were investigated. The probability distribution of extreme precipitation in the HLR was simulated with the annual maximum (AM) series and peak over threshold (POT) series by three extreme distributions, namely, generalized extreme value (GEV) distribution, generalized Pareto (GP) distribution, and gamma distribution. The parameters of the GEV, GP and gamma distributions were estimated by the L-moments method, and the best fit model was selected by the Kolmogorov-Smirnov (K-S) test. 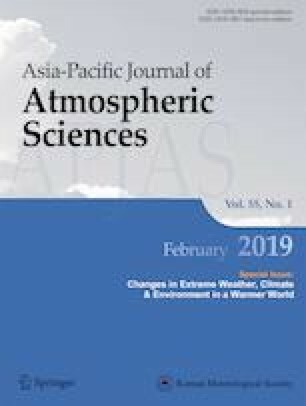 The results showed that high value area of extreme precipitation was located in the southeast part of the HLR, while the lower value area was mainly distributed in the northwestern part of the HLR and the upper reaches of the Wuding River Basin. A positive trend of annual maximum precipitation was detected at half of the stations, and the other half of the stations were found to show a negative trend from 1966 to 2015, while the changing trends of extreme precipitation at almost all of the stations were nonsignificant. From the results of the K-S test, the GEV distribution can better fit the AM series, and the GP distribution can better fit the POT series. The estimated extreme precipitation of the AM series is larger than that of the POT series with the same return period at most stations. This research was financially supported by the National Key R&D Program of China (2016YFC0402400, 2017YFC0403600) and the Natural Science Foundation of China (51779099, 41301030). The precipitation data of the meteorological stations were provided by the China Meteorological Administration (CMA), which is highly appreciated.